Early in this series we talked about “filter ratings” which amount are equivalent to a bucket of hogwash. We will see some of these here and discuss some other “over hyped” types of filters. First, they claim to have these filters tested by a third party testing facility; but they do not publish the test results, just assign a “rating number”. There is NO WAY to verify the claims. Second, there is already a standard for comparing filters, the Minimum Efficiency Reporting Value, or MERV! This is based on a standard test that all filters must use to determine the MERV. Third, the Home Depot FRP System does not address AIRFLOW! As we have seen, airflow is CRITICAL to system performance and filter performance. There is no way in this rating system to determine if a filter is going to restrict airflow or not. But Robert, it catches more particles! Fine, so does a piece of cardboard; but if you use a piece of cardboard the system will die! Fourth, it is more marketing hype than science! We are smarter than this; don’t fall for it! Having said all that let me now say this. Home Depot sells some pretty good filters; they also sell some very bad filters. You can probably buy the correct filter for your system, that you have determined ahead of time, at Home Depot. Just make sure you buy the correct filter based on the science you have learned and don’t switch to a “premium” filter in the store after you see the pretty blue stripe! 3M developed the Microparticle Performance Rating (MPR) system to demonstrate a filter’s ability to capture the smallest airborne particles—from 0.3 to 1 micron in size from the air passing through the filter. 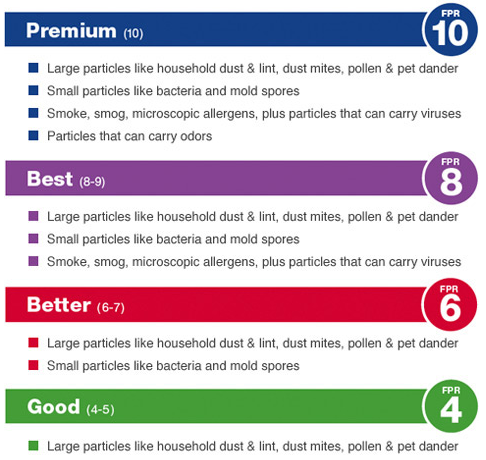 The MPR system helps you compare Filtrete filters based on the level of air filtration you want. The higher the MPR, the better the filter’s ability to capture particles from the air as it passes through the filter. MPR is different from MERV, the Minimum Efficiency Reporting Value. The MERV system measures a filter’s ability to capture large particles. The MPR only takes into account the tiny microscopic particles between 0.3 and 1 microns. Same thing, different package! This “system” has the same flaws as the Home Depot FPR; no way to verify, no standard test data available and NO AIRFLOW data! Also, MERV does take into account the smaller particles. Once a filtler begins to filter these small particles (0.3 – 1.0 microns) it is at a level of about MERV 13. The lower MERV, like MERV 8, do not efficiently filter particles this size. This is the result of a standard test criteria; NOT that MERV only measures a filters ability to capture large particles! Just about the worst thing you can do for your home HVAC system is replace your filter with a 3M/Filtrete Micro-pleat filter. I have never seen one that did not restrict airflow to dangerous levels. That’s not to say they aren’t good filters; but if you want to use them make sure your installing contractor knows so they can design the duct system to accommodate them from the beginning. Electrostatically charged filters do work well- for about a week or two. The process by which they capture filters is by having a negative charge which attracts and holds the negatively charged particles. However, once the surface is ‘covered’ by particles the electrostatic benefit is gone. This includes electric air cleaners as well. Don’t pay more for a feature that, at best, is only going to be a brief benefit. These are sold by many different names and are generally a three part filter. The outside is a fine metal or plastic mesh with a foam core; sometimes they are electrostatically charged as well. The problem with these filters are that the core never gets completely cleaned and, over time, the build up of particles in the core both reduce filtering efficiencies and airflow. I once had a customer where I replaced his old “Paul Harvey” filter (that’s where I got the nickname for them, from my customer). I noticed the new one was significantly lighter than the old one; so I weighed them both. The old one was almost 10 ounces heavier! That means he had 10 ounces of “dirt” stuck in that filter core and he cleaned it every month! Don’t fall for the “marketing hype” of Rating Systems, Cleanable Filters or electrostatically charged filters. Instead, rely on the proven testing standards of ASHRAE and MERV, the professional recommendation of you’re A/C company or your very own knowledge you have learned from these articles! Remember, use the correct filter and change it on a regular basis! Your system, and your wallet, will love you for it. Efficient Air Conditioning & Electric is a locally owned air conditioning company that has been serving greater Austin since 1976.